International Olympic Committee President Thomas Bach received an honorary doctorate degree in politics from Dankook University at its Jukjeon Campus’ Nanpa Concert Hall at 10 a.m. Friday. Dankook University’s head board of trustee Chang Choong-sik, President Jang Ho-sung, former UN Secretary-General Ban Ki-moon, Korean Sport and Olympic Committee President Lee Ki-heung and other officials attended the ceremony to congratulate Bach. IOC President Bach’s relentless efforts in supporting North Korea’s participation ahead of the Olympics contributed greatly to a thaw in relations between the two Koreas and South Korea’s successful hosting of the Winter Games. Bringing years of IOC experience, Bach displayed formidable leadership by clearly defining the committee’s role and function. The university commended Bach’s contributions to the advancement of international sports, humanity and peace. 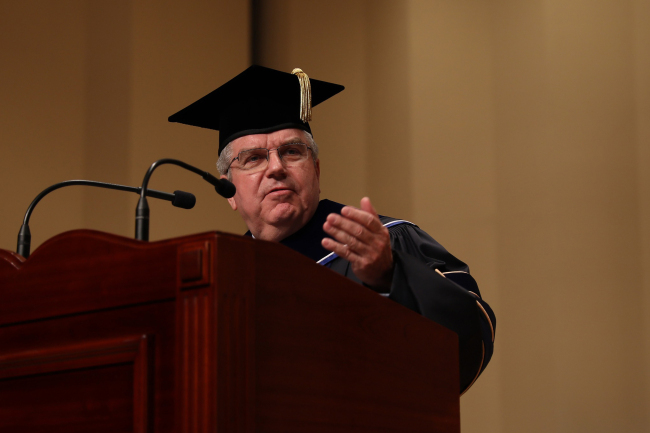 Given that the university’s motto is “Truth and Service,” the school selected Bach to receive the honorary degree. After the ceremony, Bach expressed his gratitude to the university for its efforts in helping Korean youths excel in the field of sports. “Being able to call Dankook University as ‘our’ university, I believe the university has contributed greatly in solidifying sports within Korea’s education system for the past 70 years. It is such an honor to receive this degree from a university that carries long years of tradition and history with the Olympics,” he said. Dankook University strives to build a community of love, humanity, and peace. Many sports stars in less popular sports, such as rugby and skiing, graduated from the school. Chang Choong-sik, who was the KOC vice president during the 1990 Beijing Asian Games, had paved new roads in inter-Korean relations by pushing for North Korea’s participation after nine attempts.